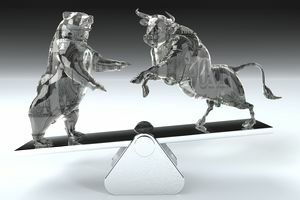 Commodity prices in the first eleven to twelve years of the new millennium experienced a massive bull market. The prices of many raw materials exploded higher over a little more than a decade, moving the commodity sector from an alternative asset class to the mainstream for investors and traders around the world. The introduction of new investment vehicles, ETF and ETN products, increased the addressable market for commodities. Before their introduction in 2004 with the gold ETF (Symbol GLD), commodity investments and participation in the markets was only available to market participants via the physical, futures for futures options markets. ETFs and ETNs made commodity investment and trading possible via traditional equity brokerage accounts. A look at the prices of many of the major commodities at the end of 1999 illustrates the massive price appreciation that occurred in this sector. The price of gold was $283 per ounce on the first day of trading in 2000; it rose to highs of $1920.70 in 2011. The price of silver was $5.355 and rose to almost $50 per ounce in 2011. Copper opened the new millennium at 85.45 cents per pound and traded to over $4.60 in 2011. Crude oil moved from $25.20 to over $147 per barrel in 2008. Corn exploded from $2.045 to almost $8.50 per bushel in 2012, and there are so many other examples for the price appreciation in raw material markets that has transpired since 2000. In 2011 and 2012, most commodity prices reached highs and in the years that followed, they corrected lower. Few raw material prices fell back to their opening 2000 levels. Some important factors ended the bull market in raw material markets. Perhaps the most important reason has been the economic slowdown in China. China, a nation with over 1.3 billion people, accounts for more than 17.5% of the world’s population. China’s double-digit growth rate became difficult to sustain as the size of its GNP grew to the second largest economy in the world. As China grew, the demand for raw materials increased. The nation spent years building infrastructure making it necessary to buy and stockpiles many commodities. China became the demand side of the fundamental equation in the world of commodities in past decades. Nations that rely on their commodity production for revenues like Australia, Canada, Brazil, Russia and others saw revenues grow, and their currencies appreciate as a result of the bull market in commodity prices. The economic slowdown in China caused demand for commodities to decline. The currencies of commodity producing nations moved lower alongside the raw material prices during the bear market period. At the same time, commodities experienced a perfect bearish storm. The U.S. dollar, the world’s reserve currency, is the pricing mechanism for raw material markets. There is a historical inverse relationship between the dollar and commodity prices. A sharp rally in the dollar that began in May 2014 caused the U.S. dollar to appreciate by over 27% by March 2015. The strong dollar caused commodity prices to fall even further, adding to price pressure as commodities moved lower in dollar terms but not necessarily in other currency terms around the world. Meanwhile, economic weakness was not limited to China. Many Asian nations suffered economic contagion from Asia’s largest economy. As China caught an economic cold; the rest of Asia got the flu. The European economy also suffered under the weight of increasing unemployment and weak economic conditions in Southern European nations that required bailouts which diluted the rest of Europe’s economy. Another blow to the European economy was a refugee crisis from the Middle East and Northern Africa which resulted in a huge inflow of people who spread out across the continent. The humanitarian crisis caused further dilution and economic pressure on Europe. In 2015 and 2016 an increase in terrorist events in Europe also added to economic weakness. Between 2011 and early 2016, many commodity prices fell to levels not seen in years. Gold fell from over $1900 to lows of just under $1050 per ounce in late 2015. Crude oil, which was still trading above $100 per barrel in June 2014, fell to a low of $26.05 in mid-February 2016. Copper fell to under $1.95 per pound in January of 2016, less than half the price it traded in 2011. The prices of agricultural commodities fell like stones due to the strong dollar and bumper crops all over the world during the years between 2012 and 2015 as perfect growing conditions exacerbated the bear market in commodity prices. Weak economic conditions around the world were an important cause for the descent of commodity prices. Central banks, following the global financial crisis in 2008, slashed interest rates and introduced policies to stimulate spending and borrowing and inhibit savings. This “stimulus” caused the final leg up in commodity prices during 2008 and 2011 as low-interest rates are inherently bullish for raw material values. Lower interest rates around the world mean that it costs less to finance or carry commodity inventories. Low-interest rates made it cheaper to carry commodity stockpiles thus providing support for the sector. However, the strength of the dollar and a continuation of lethargic economic conditions counteracted low-interest rates from 2013 through early 2016. In late 2015 and early 2016, low-interest rates remained in place around the world. In Europe and Japan, interest rates moved into negative territory – it costs money to store money in a bank. At the same time, the rally in the U.S. dollar began to falter over the first months of 2016. As the dollar moved lower, a rebound in many commodity prices occurred. The price of gold moved higher out of the gate in 2016; during the first quarter of the year, it appreciated by more than 16%, and it added to those gains in April and May. Crude oil rallied from the February 11 lows to almost $47 per barrel as of the end of April 2016 – an increase of almost 80% in ten weeks. Copper and other base metal prices moved higher. In late April, even grain prices began to move higher on a combination of uncertainty about the weather for the new crop year and a weaker U.S. currency. In another sign of increasing interest and action in commodity markets, the Baltic Dry Index appreciated from all-time lows of 290 on February 11, 2016, to over 700 and was at 631 as of May 6, 2016 – an increase of over 117%. Shipments of dry bulk commodities around the world have increased as demand and rates for ships that transport raw materials moved significantly higher over a two month period. Commodities are highly volatile and cyclical assets. Each commodity has specific supply and demand fundamentals. Agricultural commodities are highly dependent on weather conditions. Economic growth around the world influences metal prices. Precious metals are barometers of fear and uncertainty in markets. Growth and geopolitical dynamics influence energy prices. However, they all have one thing in common. During bull markets, commodities tend to rally to prices where producers increase output, inventories grow and demand recedes. Conversely, during bear markets they tend to fall to prices where production slows, inventories shrink and demand increases. These rules are a simplification of the great cycle of commodity economics. In the first half of 2016, we are seeing signs of a turn in the commodity markets after almost five years of bear market conditions. The one thing to remember about commodities is that demand for raw materials is always growing. That is because demand is ultimately a function of the number of people on planet earth. In 1959, there were less than 3 billion people in the world. In 2016, that number stood at over 7.3 billion. Commodities are finite resources; production can only expand at higher prices. That is because the ability to extract raw materials from the crust of the earth or to grow them in fertile soil depends on the price. At higher prices, higher cost production is viable but at lower prices this production becomes uneconomic. That is what caused the price of crude oil to fall from over $100 per barrel to under $30 – the world became awash in oil supplies and demand did not validate price. Commodity prices retreated after highs in 2011-2012. In 2016, there are signs that the retreat may be ending as demographic, weather, currency and other economic pressures are gathering to stabilize prices. While prices could remain at low levels for months or even years, if inventories begin to decline, we could be on the verge of a new bull market in raw material markets. Interest rates remain low or negative around the world which is a positive for the commodity sector. In the interest of stimulating economies around the world, central banks have pushed interest rates to artificially low levels. The danger of low rates is an inflationary backlash. Low-interest rates are the equivalent of printing currency. When currency becomes cheap, in a low-interest rate environment, it often takes more currency to buy less hard assets or commodities. Volatility, or price variance, in commodities, tends to be much higher than in other asset markets. Therefore, a pickup in activity in the commodities sector is a sign that economic growth could be increasing, and if commodities start to reflect the interest rate environment, inflation could result quickly. Central banks and monetary authorities may find themselves in a position where they must raise interest rates to combat inflationary pressures, which would be a negative influence on raw material prices. The potentials add up to even greater price volatility for the future. In early May 2016, we are seeing some signs that commodities are making a comeback after a long period of bear market price action. It could be a false-start but given the volatility of these markets; there is likely to be lots of action ahead in the world of commodities. Keep your seat belts fastened; commodity markets are always a wild ride.